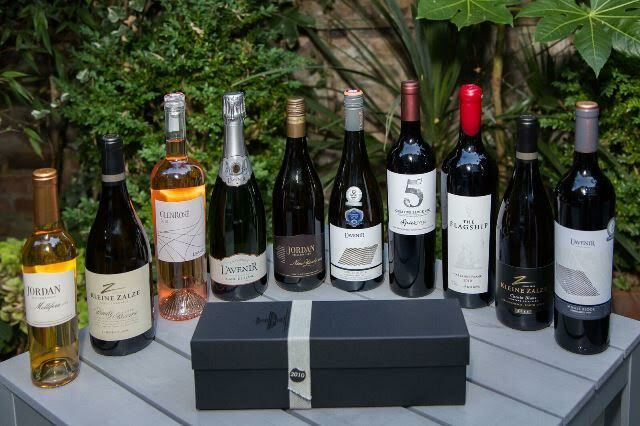 Stellenbosch Wines and TheLondonFoodie hosted a special #VisitStellenbosch evening recently to celebrate the wines from Stellenbosch. The evening demonstrated the quality of the wines from this famous South African Wine region, and its diversity in pairing with a range of flavours. TheLondonFoodie – chef, author and supperclub host – is also extremely well known on the London food scene, having graduated from Le Cordon Bleu to run his own highly successful supperclubs to publishing his acclaimed cookbook “Nikkei Cuisine: Japanese Food the South American Way”. 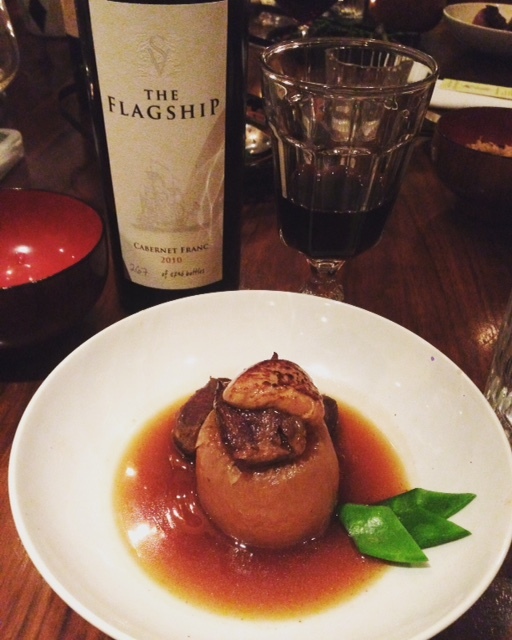 TheLondonFoodie provided a specially selected Japanese and Nikkei menu to pair with the Stellenbosch wines that we had the opportunity to sample. The combination of amazing food and incredible wines made for an exceptional event. The evening kicked off with a reception with canapés of pan-fried leek and tofu gyoza, and wasabi and butter flavoured popcorn. This was served with L’Avenir MCC Blanc de Blanc 2011, a blanc de blanc which was exceptionally creamy with rich flavours of nuts, biscuit and citrus. It had a superb crispness, and the delicate titillation of tiny bubbles left a lingering impression. This was an attractive bottle and incredibly easy to drink. Starter 1 was a tasty salmon and Sicilian prawn with a fennel Nikkei ceviche in a passion fruit and aji amarillo tiger’s milk. 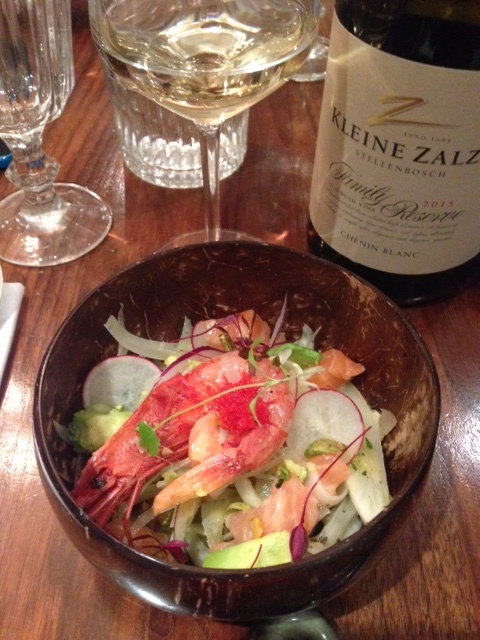 This was served with a Kleine Zalze Chenin Blanc, a delicious and easy drinking wine with concentrated aromas of guava, lychee and sweet melon, and subtle oaky notes which gave the wine a full and elegant finish. Starter 2, the “Deconstructing Sushi” was grilled scallops on rice with Tobiko Caviar, nori seaweed and a spicy creamy sauce, also served with the Kleine Zalze Chenin Blanc. This is one of my favourite dishes from TheLondonFoodie. The beautiful scallops pairing wonderfully with the delectable creamy sauce. 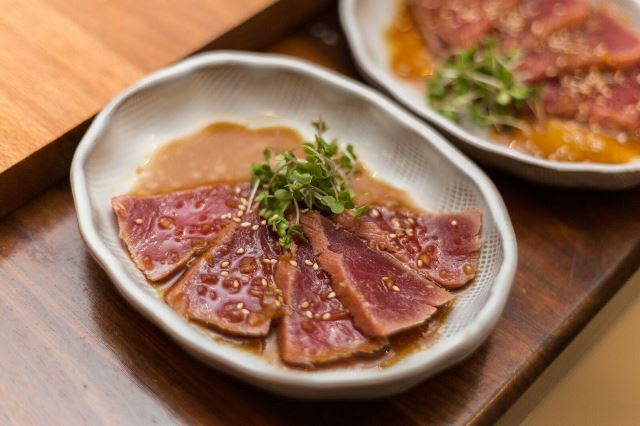 Starter 3 was the tuna tataki with yuzu-ponzu dressing (also paired with Kleine Zalze Chenin Blanc – just how versatile is this wine!!). The tuna was wonderful, especially with the citrusy freshness of the dressing. 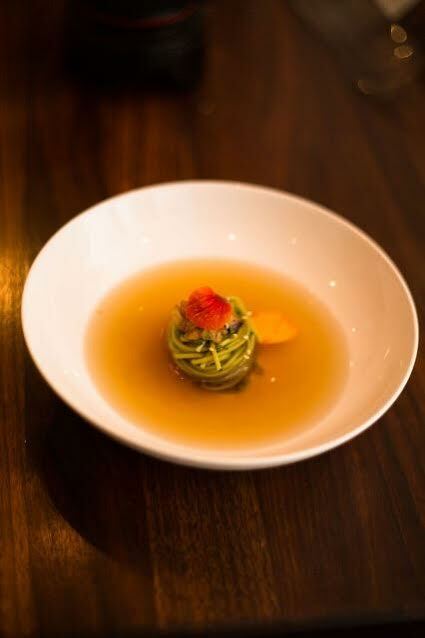 Starter 4 was a chilled green tea soba noodles with fried aubergines in a cold dashi broth. 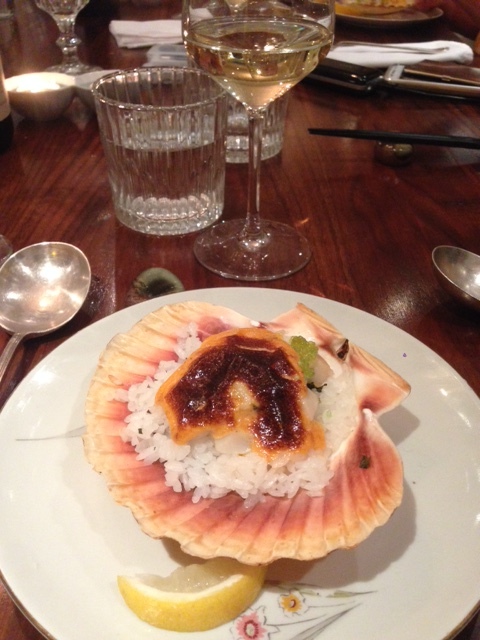 This dish was amazing, with a real elegance in the cold dashi broth. The accompanying wine was a fantastic Nine Yards Chardonnay from Jordan Wines, a luscious and rich wine, with full flavours of clove flower, butterscotch and lime oil. 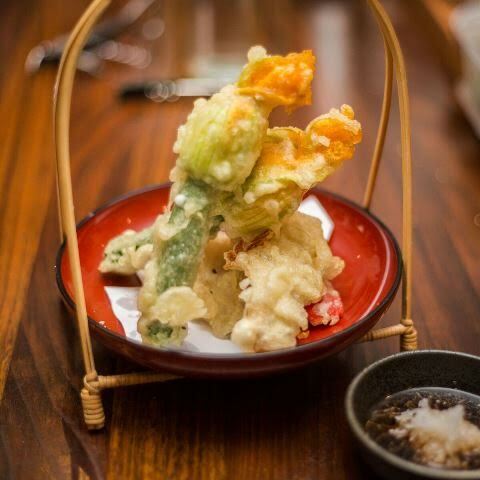 Starter 5 was a selection of scrumptious tempura including courgette flowers filled with a mousse of scallop, silken tofu and lemon, oyster mushrooms and red pepper. The main course was Iberico pork cheeks slow-braised in soy sauce, sake, brown sugar and ginger, daikon fondant and foie gras which was served with two accompaniments. The first was a hijiki gohan, Japanese rice with hijiki seaweed, carrots and Abura-Age tofu in a light dashi, and broccoli with fine green beans, sugar snaps and asparagus in saikyo miso and black sesame sauce. The pork cheek dish was delectable, beautifully succulent with a warming, mesmerising sauce. The rice was robust with flavour, and the vegetable side was wonderful with lots of flavour and fragrance coming through from the miso and the sesame sauce. The main course was paired with 3 red options. 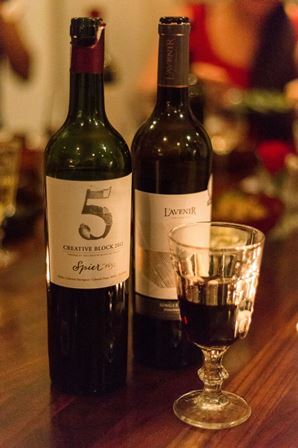 The first was a Spier Creative Block 5 2012, a deep, dark red with black cherry and currant, and hints of cedar and dark chocolate and lots of vibrant spice. The second was from Stellenbosch Vineyards, The Flagship Cabernet Franc 2010 which would pair well with any red meat as it offered a combination of plum, and blackberry with expressive notes of cassis, spice and fresh herbs. 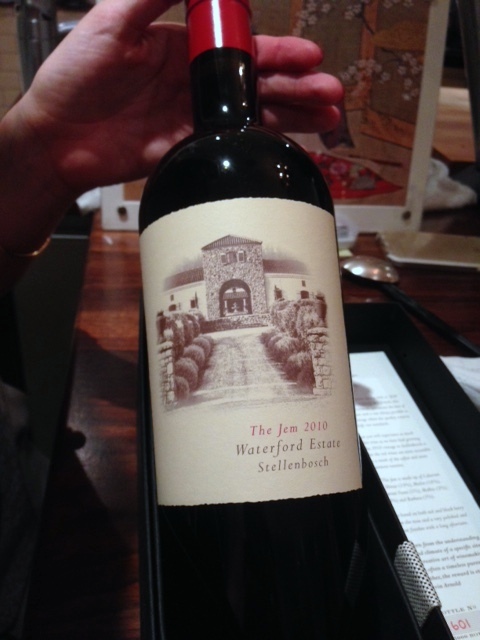 The final red option was from the Waterford Estate, The Jem 2010 which was an elegant wine with a medium level of acidity. 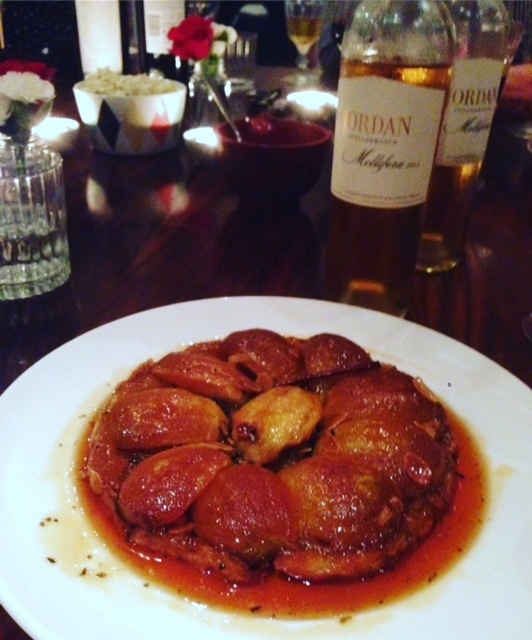 Finally to dessert – this was a delicious tarte tatin with star anise, rosemary, almonds and cinnamon, and served with vanilla crème fraiche. The accompanying dessert wine was Millifera Noble Late Harvest from Jordan Wines, a delicate and floral wine with a ripe apricot and spring blossom bouquet and well-balanced acidity levels which added elegance to the long, rich finish. It was an amazing evening, providing a wonderful opportunity to explore the depths and range of Stellenbosch wines (and enjoy some wonderful food by TheLondonFoodie). But as good as they are, I believe that Stellenbosch wines are even better at source. So the only option – #VisitStellenbosch. The post Visit Stellenbosch at TheLondonFoodie appeared first on A Girl has to Eat - (and travel) Restaurant and travel reviews.